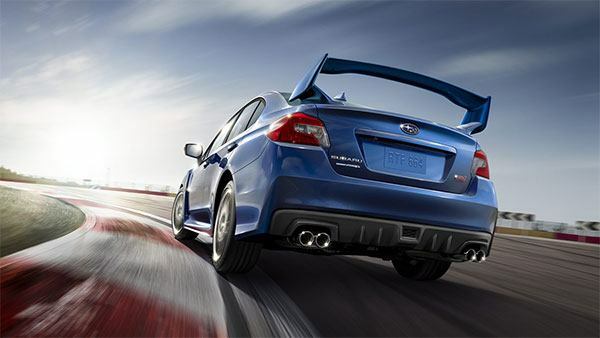 Budd's Subaru | Blog | Subaru WRX vs. WRX STI: Which One Is Right For You? Subaru WRX vs. WRX STI: Which One Is Right For You? The Subaru WRX has been a hallmark of affordable performance since the early 90’s. It quickly established a fanatical following thanks to its unique look. It remains one of the last true rally-born cars today. That rich rally heritage has since been combined with some of the most sophisticated safety and technology features. These features make it the perfect car for getting a dose of fun while going about your daily life. A perfect balance of performance and practicality is hard to find. When you add aggressive sporty styling and all-wheel-drive at this price point, the WRX becomes truly one-of-a-kind. The all-new exterior styling on both vehicles pays homage to Subaru’s racing heritage. It’s a wider, lower evolution of the Impreza (the model that gave birth to both the Subaru WRX and WRX STI) designed to deliver a more aggressive and refined look. The front is sportier with a solid-looking nose built around the new hexagonal grille. The headlights have been redesigned to emphasize the car’s wider, lower stance. But one thing hasn’t changed. Both the Subaru WRX and WRX STI still come with that distinctive, yet functional hood scoop that’s part of their heritage. Both models have been improved to allow all the power from the Subaru BOXER engines and all the traction available from Subaru’s symmetrical full-time all wheel-drive to be fully realized. The suspension was tuned for improved handling and performance, but also with an eye towards better comfort and reliability. Other changes include stiffer springs, larger diameter stabilizer bars, and dramatically increased torsional rigidity for all suspension components. Subaru engineers also added a new Torque Vectoring System to improve agility. Essentially, this system senses when you’re turning and applies a small amount of brake pressure to the inner front wheel during the turn. This distributes more of the engine torque to the outer front wheel to improve the vehicle’s cornering capabilities. First the WRX. It has the biggest change under the hood with the introduction of an all-new, twin-scroll, turbocharged 2.0L 4-cylinder BOXER engine that boasts improved acceleration, better fuel efficiency and lower emissions. It generates an impressive 268 horsepower and 258 lb.-ft. of torque. The new WRX STI keeps the 2.5L turbocharged BOXER engine that makes it so popular, but it has been retuned for 2015 to deliver even better throttle response. Horsepower is a chest-pounding 305 while torque peaks at 290 lb.ft. Both cars come with 6-speed transmissions – all new on the WRX and refined on the STI. The WRX model is linked to a viscous-coupling centre differential that delivers more uniform power distribution for better traction and sportier handling. The WRX STI version has been beefed up to handle the increased power and torque. It meshes with the multi-mode Driver Controlled Centre Differential that enables the driver to adjust the power distribution between the front and rear wheels in order to better match driving conditions or their personal driving style. The 2015 WRX also gets an optional Sport Lineartronic transmission. It’s an automatic transmission that acts like a manual, so you get the best of both worlds – convenience and driving excitement. It’s a quick-shifting transmission that features paddle shifters on the steering wheel and two different manual modes to suit your mood and/or driving styles. Finally, Subaru’s intelligent SI-Drive system is now available on all three models. It’s an advanced engine management system that allows the driver to alter the power characteristics of their car to suit their personal tastes and driving styles. The system features three distinct settings ranging from maximum fuel efficiency to maximum power and performance. The refinement theme continues inside the all-new 2015 WRX and WRX STI. The overall interior dimensions are larger. That means more leg, shoulder, and elbow room for the driver and passengers. Larger door openings also make it easier to get in and out. Plus higher hip points give the driver improved visibility out the front. The WRX features a jet-black interior with silver accents, embroidered floor mats, and performance-designed sport seats. Premium cloth upholstery is standard and rich leather upholstery is an upgrade. The WRX STI’s interior is as sporty as they come – an all-black colour scheme includes red accent sticking around the instrument panel and door panels and STI embroidering on the seatbacks and floor mats. Plus, the seats are reinforced with red leather bolsters that are as functional as they are distinctive. Both models come with a new 4.3 inch multi-function LCD display that delivers mileage and fuel economy information as well as reading from the turbo boost pressure gauge and the VDC sensor. Slip into reverse and the screen changes to show the image from the rearview camera. Both the WRX and STI are available in three models – entry-level, Sport and Sport-tech, all with the same performance. Moving up to the Sport package on both models adds the rear spoiler, a sunroof, automatic headlights, halogen fog lights, and an 8-way power driver’s seat. Go all the way to the Sport-tech model for leather seating, a premium Harman Kardon sound system and a voice-activated in-dash navigation system. A decision between the Subaru WRX and the WRX STI essentially comes down to driving preference. Although the STI is sure to attract more onlookers, it is intended to be a driver’s car. This is evidenced mainly by a stiffer suspension and lack of an automatic transmission. Still unsure which car suits you better? Come in and speak with one of our knowledgeable sales consultants.